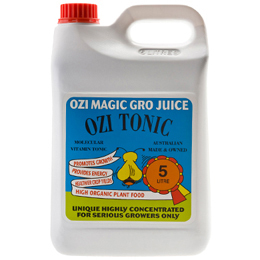 OZI TONIC is a high performance organic growth enhancer, high in potassium and phosphorus. Fortified with vitamin B plus all the necessary micro elements including naturally occurring hormones, Tricantanol and Gibberellic Acid all blended with Propolis and a range of vital organic micro organisms. OZI TONIC can be used in conjunction with your usual nutrient or with MONSTA BUD.